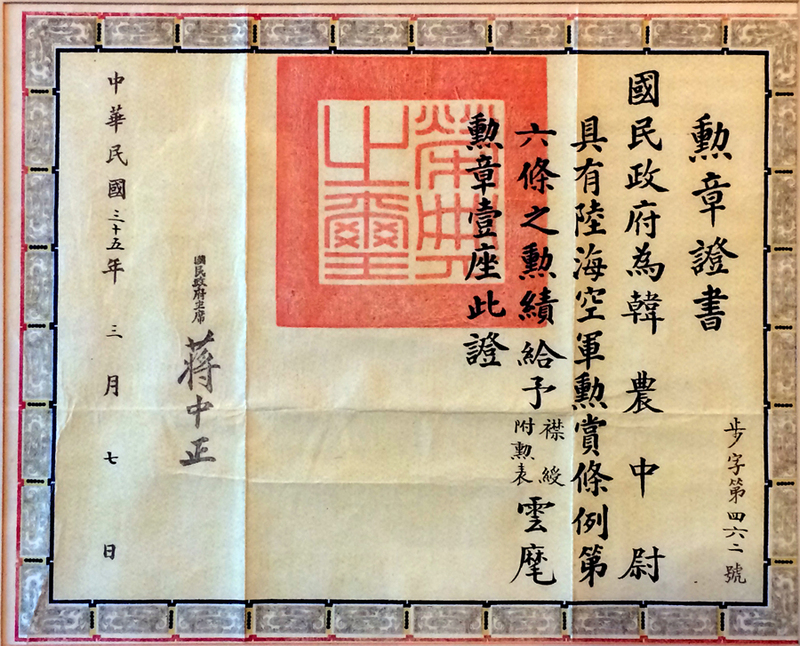 YUN HUI certificate, medal and ribon. Chris HANNON is also proud to share this certificate his father received from the Chinese Nationalist Government when the War was over. The document is dated: 7th of March 1946. This military medal, named YUN HUI is of grade 6, according to military regulations. Dated: The Repubic of China 35th year March 7. 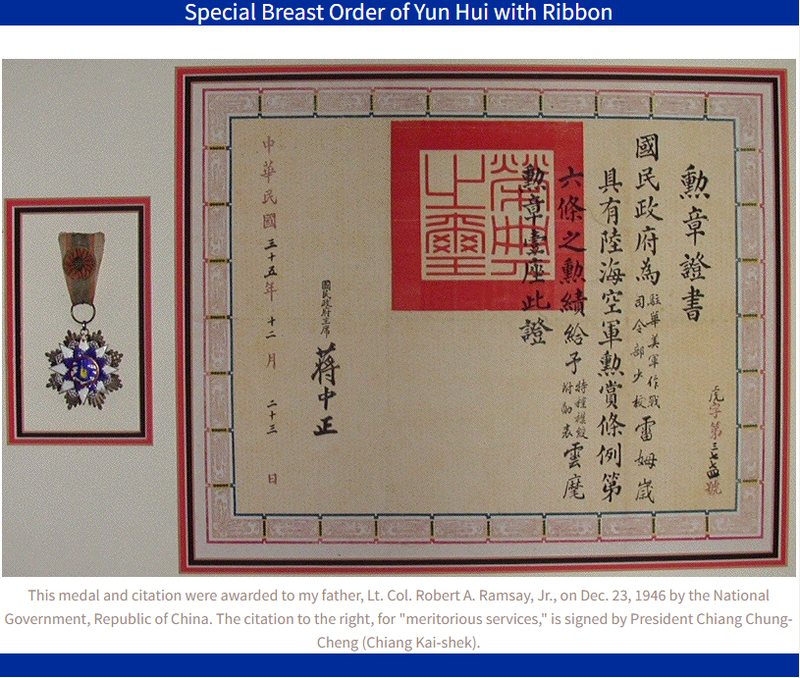 Award of Special Breast Order of Yun Hui (Order of the Cloud and Banner), which was China's highest decoration bestowed on foreigners for exceptional bravery by the President of the Republic of China, Chiang Chung Cheng (also known in the West as Chiang Kai-shek). The first medal is "The Order of the Resplendent Banner", also known as "The Order of the Cloud and Banner (Special Breast Order of the Yun Hui)". This medal was instituted on June 15, 1935 and is awarded in nine grades for contributions to national security. The insignia of the order features a fluttering yellow flag, surrounded by white clouds on a blue field. This image is surrounded by golden rays. This medal is a 6th level with special rosette. This medal is silver with enamel decoration. The medal was authorized to wear by Public Law 80-314 for military of the United States Armed Forces for the period from December 7th 1941 through to July 24th 1948. The effective dates for the medal were December 8th 1941 to September 2nd 1945. Between these dates one had to serve for at least 30 days. The obverse shows the Marco Polo Bridge over the Yeng-ding river. It symbolizes the outbreak of the Sino-Japanese war on July 7th 1937, when Japanese military attacked the town of Lukou-Chiao, which means "Marco Polo Bridge". Above the bridge the flags of the Republic of China and her Armed Forces can be found to symbolize the unity of the Chinese people. Between the flag stands a portrait of Chiang Kai-shek as Chairman of the Military Committee of the National Government during the war. In the background a city can be seen. The reverse shows a panel with the notation No. with a space open for a number or a name. Above and below that Chinese characters can be found that say what the medal stands for. The ribbon shows a central stripe bordered on both sides with a blue smaller stripe and a red edge stripe. In the center is a Chinese sunburst symbol. Size: The Cloud and Banner medal measures 6.2 cm. point to point.